Tranexamic acid administration is associated with an increased risk of posttraumatic venous thromboembolism. Myers SP et Al. J Trauma Acute Care Surg. 2019 Jan;86(1):20-27. Tranexamic acid (TXA) is used as a hemostatic adjunct for hemorrhage control in the injured patient and reduces early preventable death. However, the risk of venous thromboembolism (VTE) has been incompletely explored. Previous studies investigating the effect of TXA on VTE vary in their findings. We performed a propensity matched analysis to investigate the association between TXA and VTE following trauma, hypothesizing that TXA is an independent risk factor for VTE. This retrospective study queried trauma patients presenting to a single Level I trauma center from 2012 to 2016. Our primary outcome was composite pulmonary embolism or deep vein thrombosis. Mortality, transfusion, intensive care unit and hospital lengths of stay were secondary outcomes. Propensity matched mixed effects multivariate logistic regression was used to determine adjusted odds ratio (aOR) and 95% confidence intervals (95% CI) of TXA on outcomes of interest, adjusting for prespecified confounders. Competing risks regression assessed subdistribution hazard ratio of VTE after accounting for mortality. Of 21,931 patients, 189 pairs were well matched across propensity score variables (standardized differences <0.2). Median Injury Severity Score was 19 (interquartile range, 12-27) and 14 (interquartile range, 8-22) in TXA and non-TXA groups, respectively (p = 0.19). 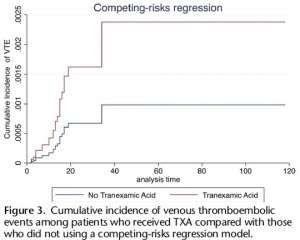 Tranexamic acid was associated with more than threefold increase in the odds of VTE (aOR, 3.3; 95% CI, 1.3-9.1; p = 0.02). Tranexamic acid was not significantly associated with survival (aOR, 0.86; 95% CI, 0.23-3.25; p = 0.83). Risk of VTE remained elevated in the TXA cohort despite accounting for mortality (subdistribution hazard ratio, 2.42; 95% CI, 1.11-5.29; p = 0.03). Tranexamic acid may be an independent risk factor for VTE. Future investigation is needed to identify which patients benefit most from TXA, especially given the risks of this intervention to allow a more individualized treatment approach that maximizes benefits and mitigates potential harms. Confirmation par l'étude PAMPER de tout l'intérêt de l'apport préhospitalier précoce d'au moins deux unités de plasma. Cette étude porte sur plus de 500 traumatisés graves essentiellement fermés, surtout secondaires à des AVP avec tout de même une motralité qui paraît très élevée. Il semblerait que l'administration avant l'arrivée en structure chirurgicale (mesurée dans ce travail à 1h) soit déterminante. Cependant, elle n'inclue que 20% de plaies pénétrantes sans faire mention d'IED, ce qui limite fortement une extrapolation simple aux blessés par arme de guerre., ce d'autant que le tableau 2 montre que dans ce sous groupe le traitement conventionnel ferait mieux en terme de survie. Un éditorial abordant les problématiques "logistiques" liée à l'emploi du plasma accompagne cette publication (1). Lire également (2, 3). A total of 501 patients were evaluated: 230 patients received plasma (plasma group) and 271 received standard-care resuscitation (standard-care group). Mortality at 30 days was significantly lower in the plasma group than in the standard-care group (23.2% vs. 33.0%; difference, -9.8 percentage points; 95% confidence interval, -18.6 to -1.0%; P=0.03). A similar treatment effect was observed across nine prespecified subgroups (heterogeneity chi-square test, 12.21; P=0.79). Kaplan-Meier curves showed an early separation of the two treatment groups that began 3 hours after randomization and persisted until 30 days after randomization (log-rank chi-square test, 5.70; P=0.02). The median prothrombin-time ratio was lower in the plasma group than in the standard-care group (1.2 [interquartile range, 1.1 to 1.4] vs. 1.3 [interquartile range, 1.1 to 1.6], P<0.001) after the patients' arrival at the trauma center. No significant differences between the two groups were noted with respect to multiorgan failure, acute lung injury-acute respiratory distress syndrome, nosocomial infections, or allergic or transfusion-related reactions. In injured patients at risk for hemorrhagic shock, the prehospital administration of thawed plasma was safe and resulted in lower 30-day mortality and a lower median prothrombin-time ratio than standard-care resuscitation. Relative effects of plasma, fibrinogen concentrate, and factor XIII on ROTEM coagulation profiles in an in vitro model of massive transfusion in trauma. Un travail qui est en faveur de l'association de fibrinogène et de plasma pour la prise en charge des hémorragies massives. Dans le contexte militaire, une stratégie basée sur l'apport initial du fibrinogène puis du Plyo apparaît censé (1). Lire les reco européennes. Massive traumatic haemorrhage is aggravated through the development of trauma-induced coagulopathy, which is managed by plasma transfusion and/or fibrinogen concentrate administration. It is yet unclear whether these treatments are equally potent in ensuring adequate haemostasis, and whether additional factor XIII (FXIII) administration provides further benefits. In this study, we compared ROTEM whole blood coagulation profiles after experimental massive transfusion with different transfusion regimens in an in vitro model of dilution- and transfusion-related coagulopathy. Healthy donor blood was mixed 1 + 1 with six different transfusion regimens. Each regimen contained RBC, platelet concentrate, and either fresh frozen plasma (FFP) or Ringer's acetate (RA). The regimens were further augmented through addition of a low- or medium-dose fibrinogen concentrate and FXIII. Transfusion with FFP alone was insufficient to maintain tissue-factor activated clot strength, coincidental with a deficiency in fibrin-based clot strength. Fibrinogen concentrate conserved, but did not improve coagulation kinetics and overall clot strength. Only combination therapy with FFP and low-dose fibrinogen concentrate improved both coagulation kinetics and fibrin-based clot strength. Administration of FXIII did not result in an improvement of clot strength. In conclusion, combination therapy with both FFP and low-dose fibrinogen concentrate improved clotting time and produced firm clots, representing a possible preferred first-line regimen to manage trauma-induced coagulopathy when RBC and platelets are also transfused. Further research is required to identify optimal first-line transfusion fluids for massive traumatic haemorrhage. Fractions coagulantes: Mieux que PFC ? Reversal of trauma-induced coagulopathy using first-line coagulation factor concentrates or fresh frozen plasma (RETIC): a single-centre, parallel-group, open-label, randomised trial. Innerhofer P et Al. Lancet Haematol. 2017 Apr 27. pii: S2352-3026(17)30077-7. Un travail dont les conclusions sont très claires. La prise en charge de la coagulopathie traumatique bénéficie bien plus d'une stratégie d'apports ciblés de fractions coagulantes concentrées, notamment de fibrinogène ici 50 mg/kg, qu'une stratégie classique basée sur l'apport de PFC. Effective treatment of trauma-induced coagulopathy is important; however, the optimal therapy is still not known. We aimed to compare the efficacy of first-line therapy using fresh frozen plasma (FFP) or coagulation factor concentrates (CFC) for the reversal of trauma-induced coagulopathy, the arising transfusion requirements, and consequently the development of multiple organ failure. This single-centre, parallel-group, open-label, randomised trial was done at the Level 1 Trauma Center in Innsbruck Medical University Hospital (Innsbruck, Austria). Patients with trauma aged 18–80 years, with an Injury Severity Score (ISS) greater than 15, bleeding signs, and plasmatic coagulopathy identified by abnormal fibrin polymerisation or prolonged coagulation time using rotational thromboelastometry (ROTEM) were eligible. Patients with injuries that were judged incompatible with survival, cardiopulmonary resuscitation on the scene, isolated brain injury, burn injury, avalanche injury, or prehospital coagulation therapy other than tranexamic acid were excluded. We used a computer-generated randomisation list, stratification for brain injury and ISS, and closed opaque envelopes to randomly allocate patients to treatment with FFP (15 mL/kg of bodyweight) or CFC (primarily fibrinogen concentrate [50 mg/kg of bodyweight]). Bleeding management began immediately after randomisation and continued until 24 h after admission to the intensive care unit. The primary clinical endpoint was multiple organ failure in the modified intention-to-treat population (excluding patients who discontinued treatment). Reversal of coagulopathy and need for massive transfusions were important secondary efficacy endpoints that were the reason for deciding the continuation or termination of the trial. This trial is registered with ClinicalTrials.gov, number NCT01545635. Between March 3, 2012, and Feb 20, 2016, 100 out of 292 screened patients were included and randomly allocated to FFP (n=48) and CFC (n=52). Six patients (four in the FFP group and two in the CFC group) discontinued treatment because of overlooked exclusion criteria or a major protocol deviation with loss of follow-up. 44 patients in the FFP group and 50 patients in the CFC group were included in the final interim analysis. The study was terminated early for futility and safety reasons because of the high proportion of patients in the FFP group who required rescue therapy compared with those in the CFC group (23 [52%] in the FFP group vs two [4%] in the CFC group; odds ratio [OR] 25·34 [95% CI 5·47–240·03], p<0·0001) and increased needed for massive transfusion (13 [30%] in the FFP group vs six [12%] in the CFC group; OR 3·04 [0·95–10·87], p=0·042) in the FFP group. Multiple organ failure occurred in 29 (66%) patients in the FFP group and in 25 (50%) patients in the CFC group (OR 1·92 [95% CI 0·78–4·86], p=0·15). Our results underline the importance of early and effective fibrinogen supplementation for severe clotting failure in multiple trauma. The available sample size in our study appears sufficient to make some conclusions that first-line CFC is superior to FFP. Ten percent of deaths worldwide are due to trauma, and it is the third most common cause of death in the United States. Despite a profound upregulation in procoagulant mechanisms, one-quarter of trauma patients present with laboratorybased evidence of trauma-induced coagulopathy (TIC), which is associated with poorer outcomes including increased mortality. The most common causes of death after trauma are hemorrhage and traumatic brain injury (TBI). 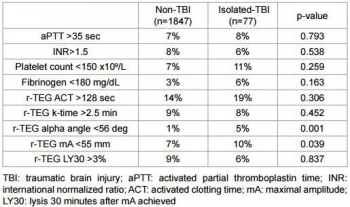 The management of TIC has significant implications in both because many hemorrhagic deaths could be preventable, and TIC is associated with progression of intracranial injury after TBI. This review covers the most recent evidence and advances in our understanding of TIC, including the role of platelet dysfunction, endothelial activation, and fibrinolysis. Trauma induces a plethora of biochemical and physiologic changes, and despite numerous studies reporting differences in coagulation parameters between trauma patients and uninjured controls, it is unclear whether some of these differences may be “normal” after trauma. Comparisons between trauma patients with differing outcomes and use of animal studies have shed some light on this issue, but much of the data continue to be correlative with causative links lacking. In particular, there are little data linking the laboratory-based abnormalities with true clinically evident coagulopathic bleeding. For these reasons, TIC continues to be a significant diagnostic and therapeutic challenge. Bien que cela reste encore discuté, l'apport précoce de fibrinogène améliorerait la survie des traumatisés sévères. Cette publication est du moins en faveur de cette hypothèse. Patients with severe trauma often present with critical coagulopathy, resulting in impaired hemostasis, massive hemorrhage, and a poor survival prognosis. The efficacy of hemostatic resuscitation in correcting coagulopathy and restoring tissue perfusion has not been studied. We assessed a novel approach of pre-emptive administration of fibrinogen concentrate to improve critical coagulopathy in patients with severe trauma. need for massive transfusion before measurement of fibrinogen. ∼56% of patients with an ISS ≥26 and transfused with red blood cell concentrates ≥10 units, had hypofibrinogenemia (fibrinogen <1.5 g/L) on arrival. Patients who received fibrinogen concentrate in group C showed significantly higher fibrinogen levels after treatment with this agent than those in group B (2.41 g/L vs 1.88 g/L; p=0.01). Although no significant difference was observed in blood transfusion volumes between the groups, the 30-day survival of patients in group C (all, and those with an ISS ≥26) was significantly better than in group A ( p<0.05). The 48-hour mortality rate in patients with an ISS ≥26 was significantly lower in group C than in group A (8.6% vs 22.9%; p=0.005). Further, among patients with an ISS ≥41, the overall mortality was significantly lower in group C than in group A (20% vs 50%; p=0.02). Pre-emptive administration of fibrinogen concentrate for patients with trauma with critical coagulopathy may contribute to improved survival. Albumine 20% plutôt que fibrinogène ? Dans ce travail et alors que l'albumine diluée n'est pas recommandée, les auteurs évoquent la possibilité que les effets favorables d'une réanimation basée sur l'apport de plasma serait lié à l'apport de protéine et en particulier d'albumine qui aurait un effet tampon élevé, réduisant l'acidose métabolique, un des facteurs de la triade létale. Plasma infusion with or without red blood cells is the current military standard of care for prehospital resuscitation of combat casualties. We examined possible advantages of early and limited resuscitation with fresh plasma compared with a single plasma protein or crystalloid solutions in an uncontrolled hemorrhage model in rabbits. Anesthetized spontaneously breathing rabbits (3.3 ± 0.1 kg) were instrumented and subjected to a splenic uncontrolled hemorrhage. Rabbits in shock were resuscitated at 15 minutes with Plasma-Lyte (PAL; 30 mL/kg), PAL + fibrinogen (PAL + F; 30 mL + 100 mg/kg), fresh rabbit plasma (15 mL/kg), or 25% albumin (ALB; 5 mL/kg) solution, all given in two bolus intravenous injections (15 minutes apart) to achieve a mean arterial pressure of 65 mm Hg, n = 8 to 9/group. Animals were monitored for 2 hours or until death, and blood loss was measured. Blood samples and tissues were collected and analyzed. There were no differences among groups in baseline measures and their initial bleeding volume at 15 minutes. At 60 minutes after injury, mean arterial pressure was higher with ALB than with crystalloids (PAL or PAL + F), but shock indices were not different despite the large differences in resuscitation volumes. Fibrinogen addition to PAL only increased clot strength. Plasma resuscitation increased survival rate (75%) without significant improvement in coagulation measures. Albumin administration replenished total plasma protein and increased survival rate to 100% (p < .05 vs. crystalloids). No histological adverse events were identified in the vital organs. Acide tranexaminique systématique: La roue tournerait-elle ? Moore HB et Al. J Am Coll Surg. 2016 Apr;222(4):347-55. Fibrinolysis is a physiologic process that maintains microvascular patency by breaking down excessive fibrin clot. Hyperfibrinolysis is associated with a doubling of mortality. Fibrinolysis shutdown, an acute impairment of fibrinolysis, has been recognized as a risk factor for increased mortality. The purpose of this study was to assess the incidence and outcomes of fibrinolysis phenotypes in 2 urban trauma centers. Injured patients included in the analysis were admitted between 2010 and 2013, were 18 years of age or older, and had an Injury Severity Score (ISS) > 15. Admission fibrinolysis phenotypes were determined by the clot lysis at 30 minutes (LY30): shutdown ≤ 0.8%, physiologic 0.9% to 2.9%, and hyperfibrinolysis ≥ 3%. Logistic regression was used to adjust for age, arrival blood pressure, ISS, mechanism, and facility. There were 2,540 patients who met inclusion criteria. Median age was 39 years (interquartile range [IQR] 26 to 55 years) and median ISS was 25 (IQR 20 to 33), with a mortality rate of 21%. Fibrinolysis shutdown was the most common phenotype (46%) followed by physiologic (36%) and hyperfibrinolysis (18%). Hyperfibrinolysis was associated with the highest death rate (34%), followed by shutdown (22%), and physiologic (14%, p < 0.001). The risk of mortality remained increased for hyperfibrinolysis (odds ratio [OR] 3.3, 95% CI 2.4 to 4.6, p < 0.0001) and shutdown (OR 1.6, 95% CI 1.3 to 2.1, p = 0.0003) compared with physiologic when adjusting for age, ISS, mechanism, head injury, and blood pressure (area under the receiver operating characteristics curve 0.82, 95% CI 0.80 to 0.84). Fibrinolysis shutdown is the most common phenotype on admission and is associated with increased mortality. These data provide additional evidence of distinct phenotypes of coagulation impairment and that individualized hemostatic therapy may be required. Les études CRASH2 et MATTERS ont mis en évidence l'intérêt de l'emploi du TXA en traumatologie grave. Persistent malgré tout quelques interrogations en matière d'innocuité persistent. Si l'étude crash2 n' pas montré de risque thromboembolique majeurs, ce n'est pas le cas d' l'étude MATTERS avec environ 10 fois plus d'épisodes thrombo-emboliques en cas d'usage de TXA. Par ailleurs il est rapporté un risque d'hypotension lors de l'administration rapide de TXA et de convulsions lors de l'emploi de posologies élevées. Ceci ne remet pas en cause le recours précoce au TXA dont l'emploi ne doit pas être banalisé et respecter un certain nombre de règles: probabilité forte de coagulopathie traumatique notamment attesté par une hypotension sévère , 1ère dose le plus tôt possible (au mieux dans la première heure) et pas après 3h, deuxième dose dans les 08h00, administration lente pour éviter hypotension, pas de surdosage facteur de crises convulsives, ne pas administrer en même temps/même ligne que du PLYO. 1. L'étude "Pre-hospital Antifibrinolytics for Traumatic Coagulopathy and Haemorrhage" a pour objectif d'affiner notre connaissance de l'emploi du TXA. 2.L'étude "Design of the Study of Tranexamic Acid during Air Medical Prehospital Transport (STAAMP) Trial: Addressing the Knowledge Gaps" a pour objet d'étuider la mortalité à 30 jours de traumatisés sévères pris en charge par medevac héliportées. 3. L'étude "Tranexamic Acid Mechanisms and Pharmacokinetics In Traumatic Injury (TAMPITI Trial)" vise quand à elle à confirmer un certain nombre d'hypothèses sur le mécanisme d'action. Par ailleurs, le TXA n'est pas le seul antifibrinolyique utilisable. Antifibrinolytic agents in current anaesthetic practice. Ortmann E. et Al. BJA 111 (4): 549–63 (2013). Napolitano LM, Cohen MJ, Cotton BA, et al. Tranexamic acid in trauma: how should we use it? J Trauma Acute Care Surg 2013; 74: 1575-1586. Le damage control resuscitation fait largement appel à l'apport de plasma, concentrés de globules rouges et de plaquettes dans un rapport de 1/1/1 (1). Malgré la relative correction de la coagulopathie la survie à long terme ne semble pas être améliorée (2). Aussi certains proposent d'avoir plutôt recours à l'administration précoce de fibrinogène plutôt que l'administration de plasma. Le travail suivant qui propose l'apport précoce de 2g de fibrinogène est en faveur d'une telle démarche. Hemorrhage is the principal cause of death in the first few hours following severe injury. 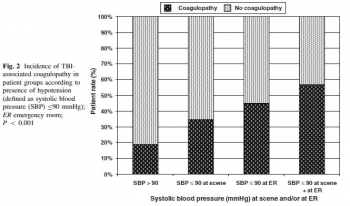 Coagulopathy is a frequent complication of critical bleeding. 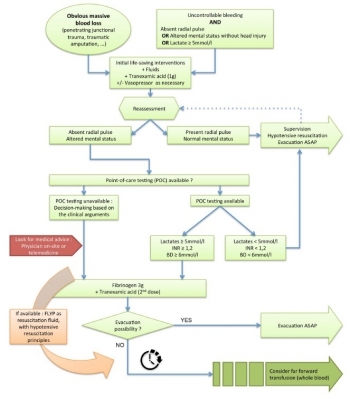 A network of Italian trauma centers recently developed a protocol to prevent and treat trauma-induced coagulopathy. A pre-post cohort multicenter study was conducted to assess the impact of the early coagulation support (ECS) protocol on blood products consumption,mortality and treatment costs. We prospectively collected data from all severely injured patients (Injury Severity Score (ISS) >15) admitted to two trauma centers in 2013 and compared these findings with the data for 2011. Patients transfused with at least 3 units of packed red blood cells (PRBCs) within 24 hours of an accident were included in the study. In 2011, patients with significant hemorrhaging were treated with early administration of plasma with the aim of achieving a high (≥1:2) plasma-to-PRBC ratio. In 2013, the ECS protocol was the treatment strategy. Outcome data, blood product consumption and treatment costs were compared between the two periods. The two groups were well matched for demographics, injury severity (ISS: 32.9 in 2011 versus 33.6 in 2013) and clinical and laboratory data on admission. In 2013, a 40% overall reduction in PRBCs was observed, together with a 65% reduction in plasma and a 52% reduction in platelets. Patients in the ECS group received fewer blood products: 6.51 units of PRBCs versus 8.14 units. Plasma transfusions decreased from 8.98 units to 4.21 units (P <0.05), and platelets fell from 4.14 units to 2.53 units (P <0.05). Mortality in 2013 was 13.5% versus 20% in 2011 (13 versus 26 hospital deaths, respectively) (nonsignificant). When costs for blood components, factors and point-of-care tests were compared, a €76,340 saving in 2013 versus 2011 (23%) was recorded. The introduction of the ECS protocol in two Italian trauma centers was associated with a marked reduction in blood product consumption, reaching statistical significance for plasma and platelets, and with a non-significant trend toward a reduction in early and 28-daymortality. The overall costs for transfusion and coagulation support (including point-of-care tests) decreased by 23% between 2011 and 2013. Reports of survival benefits of early transfusion of plasma with red blood cells (1:1 ratio) in trauma patients suggest that plasma may be a better fluid to replace Hextend for battlefield resuscitation. We studied possible advantages of prehospital resuscitation with plasma compared with Hextend or albumin in a model of uncontrolled hemorrhage. Male New Zealand white rabbits (3.3 T 0.1 kg) were anesthetized, instrumented, and subjected to a splenic injury with uncontrolled bleeding. Ten minutes after injury (mean arterial pressure [MAP] G 40 mm Hg), the rabbits received small and equal volumes (15 mL/kg) of rabbit plasma (n = 10), Hextend (n = 10), or 5% human albumin (n = 9) or no fluid. Fluids were administered in two bolus injections (20 minutes apart) and targeted to aMAP of 65 mm Hg. Animals were monitored for 2.5 hours or until death, and their blood losses were measured. Arterial blood samples were collected at different times and analyzed for ABG, CBC, and coagulation tests. There were no differences in baseline measures among groups. Splenic injury caused similar hemorrhages (9.1 T 0.4 mL/kg at 10 minutes) and decreased MAP in all subjects. Subsequent resuscitation initiated additional bleeding. At 60 minutes after injury (20 minutes after resuscitation), longer activated partial thromboplastin time and lower fibrinogen concentrations were apparent compared with baseline values with differences among groups. Thrombelastography analysis indicated faster and stronger clot formation with plasma and albumin resuscitation than with Hextend use. Shock indices were increased in all groups, but smaller changes were measured in the albumin group. Total blood loss did not differ among resuscitated rabbits but was higher (p G 0.05) than among nonresuscitated animals. Survival rates were 11% (untreated), 40% (Hextend and plasma), and 89% (albumin, p G 0.05). Dépakine chez le blessé cranien en choc ? Le concept du damaged control resuscitation fait appel en partie à de nouvelles modalités transfusionnelles et d'emploi de fractions coagulantes. D'autres approches sont possibles comme celles visant à restuarer la fonction plaquettaire. C'est ce que permettrait l'adminsitration de médicaments appartenant à la classe des inhibiteurs des histone deacetylase et dont les effets neuroprotecteurs pourraient ainsi être mis à profit. Le document proposé semble conforter cette approche. We have previously shown that resuscitation with fresh frozen plasma (FFP) in a large animal model of traumatic brain injury (TBI) and hemorrhagic shock (HS) decreases the size of the brain lesion, and that addition of a histone deacetylase inhibitor, valproic acid (VPA), provides synergistic benefits. In this study, we hypothesized that VPA administration would be associated with a conservation of platelet function as measured by increased platelet activation after resuscitation. Ten swine (42-50 kg) were subjected to TBI and HS (40% blood loss). Animals were left in shock for 2 h before resuscitation with either FFP or FFP+VPA (300 mg/kg). Serum levels of platelet activation markers transforming growth factor beta, CD40 L, P-selectin, and platelet endothelial cell adhesion molecule (PECAM) 1 were measured at baseline, postresuscitation, and after a 6-h observation period. Platelet activation markers were also measured in the brain whole cell lysates and immunohistochemistry. Circulating P-selectin levels were significantly higher in the FFP+VPA group compared with the FFP alone group (70.85±4.70 versus 48.44±7.28 ng/mL; P<0.01). Likewise, immunohistochemistry data showed elevated P-selectin in the VPA treatment group (22.30±10.39% versus 8.125±3.94%, P<0.01). Serum sCD40L levels were also higher in the FFP+VPA group (3.21±0.124 versus 2.38±0.124 ng/mL; P<0.01), as was brainsCD40L levels (1.41±0.15 versus 1.22±0.12 ng/mL; P=0.05). Circulating transforming growth factor beta levels were elevated in the FFP+VPA group, but this did not reach statistical significance (11.20±1.46 versus 8.09±1.41 ng/mL; P=0.17). Brain platelet endothelial cell adhesion molecule 1 levels were significantly lower in the FFP+VPA group compared with the FFP group (5.22±2.00 pg/mL versus 7.99±1.13 pg/mL; P=0.03). 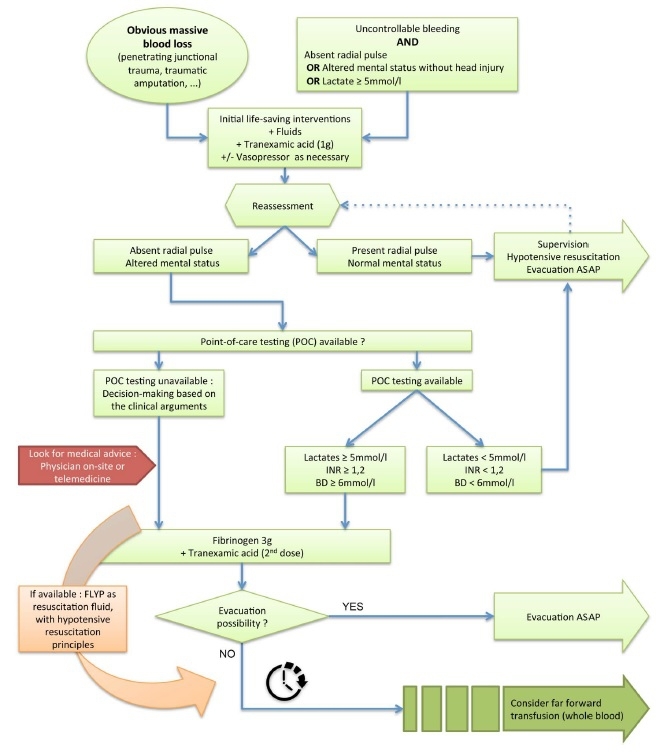 In this clinically relevant large animal model of combined TBI+HS, the addition of VPA to FFP resuscitation results in an early upregulation of platelet activation in the circulation and the brain. The previously observed neuroprotective effects of VPA may be due to a conservation of platelet function as measured by a higher platelet activation response after resuscitation.